Ask anyone living in Orlando why they love the city and the answer would be ‘the best day trips from Orlando’. You will find several towns, theme parks, state parks, historical landmarks, beaches, sports venues and much more in and around Orlando. Within an easy drive, you can complete a round having ample time to spend at the destination. There are plenty of such places, out of which we have jotted down the unforgettable day trips from Orlando for you. You will love the time with your friends and family at these fantastic places. Planning a 3-4 days trip to Orlando already? Take one day down for one place and you can tick a maximum of four from the below list. Check them out now! One of the best family day trips from Orlando is the theme park, LEGOLAND. If you have kids below the age of 12, no other place could suited them best but this. Just at a 45-minutes’ drive from Orlando city, it is a huge 150 acres theme park showcasing numerous rides, shows and a botanical garden to relax. Located at a distance of a short 50-minute drive, Kennedy Space Center is a perfect ode to America’s space program. Housing the Space Shuttle Atlantis, the visitor complex boasts an informative tour of the Space center, a few rides, 2 fantastic 3D IMAX movies and even a chance to meet an astronaut – Yes, for real! However check the website before planning your day, may be you get lucky enough to witness a rocket launch. One of the amazing weekend trips from Orlando is to the Blue Springs State Park. A short 50-minute drive towards north of Orlando Downtown is this 2,600 acre state park that includes the largest spring (310mile) on the St. Johns River. You can snorkel, swim or go for scuba diving in the crystal clear waters of the 72degree spring throughout the year except from November to March. As winter sets in, the large manatee population reserves the waters. If you are planning a weekend trip, leave early in the morning to find a better place for parking. 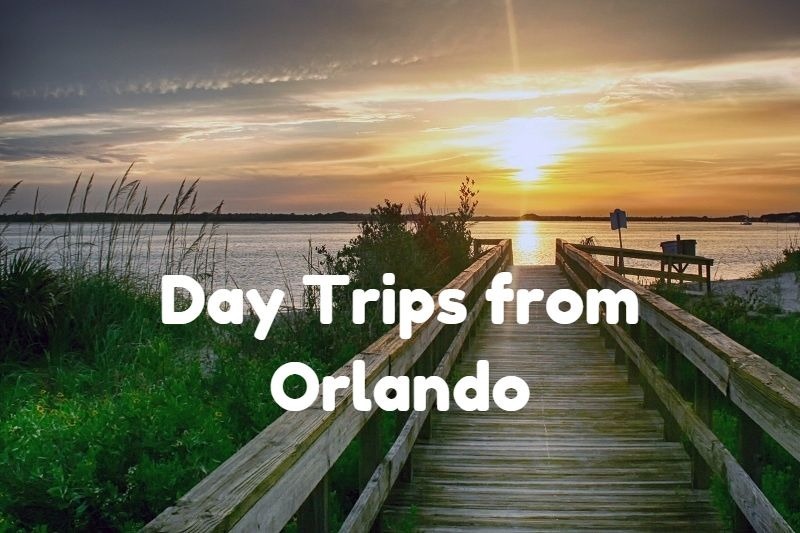 If you haven’t been to Orlando ever, get last minute flights booked now and go for this relaxing day trip. Visit this ever charming lakefront town in downtown, within a 40-minutec drive from the city. Mount Dora welcomes anyone and everyone interested in antiques. Believe it or not, it is the favorite getaway for antique hunters. The area exhibits antique dealers lined up on the foot of the street. You will see thousands of people coming to the vast Farmer’s Market and Renninger’s Flea. By evening, reach a lakefront restaurant and watch the spectacular view of sunset. Go to the famous vacation destination Tampa Bay along with Clearwater and St. Petersburg. Take that 80-minute drive to visit the Busch Gardens Tampa, the aesthetic Ybor City, the majestic Gulf beaches, Seminole Hard Rock Casino and several beautiful downtown areas. Tampa Bay area offers one of the perfect beach day trips from Orlando. Are you a sports lover? Here, you can even catch an NFL, NHL or Major Baseball League match. Ariel is not the only Central Florida mermaid. Even before Mickey Mouse moving to the Magic Kingdom, mermaids swam to their underwater oasis at Weeki Wachee Springs State Park. It was in the year 1947 that Newt Perry, an ex-navy frogman constructed an underwater theatre and gave life to the first underwater show at Weeki Wachee. For more than half a century now, the show features little mermaids dancing and performing stunts in shows like Fish Tails and The Little Mermaid. No mater how old a concept it might be, the shows delights viewers till date, irrespective of their age. Manatees are the marine mammal in the state of Florida that reserves the river waters during winter months. Also known as sea cows due to their languid water movements, Manatees are not meant to be a good swimming companion for us humans. It is only in the Crystal River that visitors are allowed to swim with the Manatees for real. Yes, it is legal in Crystal River! Have a business meeting there in Orlando and business class flights are already booked? Great news, extend your trip for a day or two and plan a day trip to River Crystal. Various tour operators like Bird’s Underwater offers snorkeling trips right by the side of these mammals. To explore the natural wonders around and manatees in the river, you can also rent canoes or kayaks. The warm water springs makes it the perfect place to swim, despite the winter season. Live this fantastically adventurous moment for live, here in Orlando.